This week American Standard issued a press release highlighting the latest technology available in its Selectronic line of faucets. 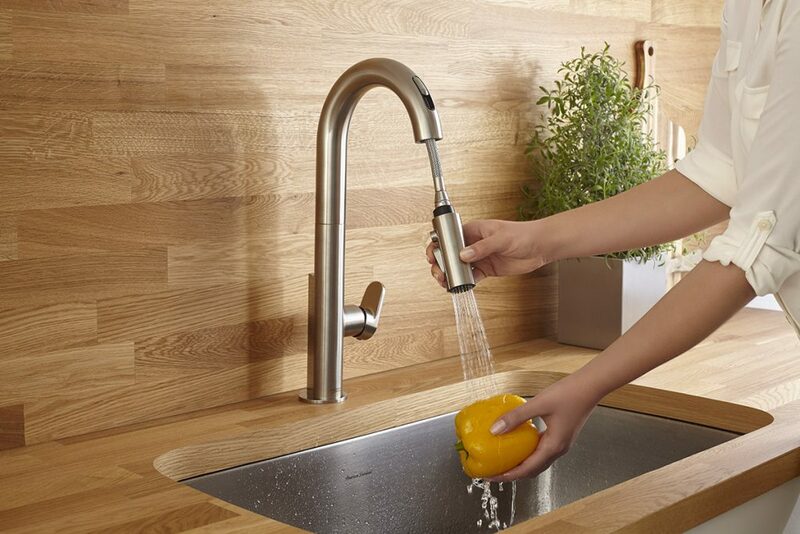 Showcasing contemporary design and superb performance, the new Beale high-arc kitchen faucet collection features a Selectronic touchless model offering the unique option of switching to manual operation by simply sliding a movable door to cover the sensor. Delivering effortless wave-on/wave-off functionality, the Selectronic Beale faucet helps reduce the risk of cross-contamination in food preparation. The Selectronic proximity technology delivers dependable, touchless operation to improve hygiene, while also making it easy to access the faucet when the user’s hands are full or dirty. The option to change to manual operation provides flexibility with the Selectronic Beale to suit the user’s preference and comfort level with touchless faucet technology. By gliding the movable door to cover the sensor, the faucet can operate manually by guests and others using the kitchen. An LED indicator signals that the hands-free mode has been activated. In addition to this hands-free model, the Beale collection also includes a hand-operated pull-down kitchen faucet and a design-matched manual bar faucet. All three luxury faucets feature smooth, single-handle functionality for ease of use and clean, attractive lines to provide a brilliant focal point in any modern kitchen setting. Additionally, these faucets deliver powerful spray and stream performance employing a water-conserving flow rate of only 1.5 gallons per minute (gpm). This is more than a 30 percent reduction over the volume used by industry-standard 2.2 gpm kitchen faucets. All Beale faucets offer a choice of two spray patterns ̶ stream and spray ̶ as well as a pause feature that is useful when filling a large container outside of the sink. Beale faucets feature Re-Trax, which provides smooth operation and superior spray head retraction; and Dock-Tite, the magnetic mechanism that keeps the pull-down spray head tightly secured to the spout. Visit American Standard’s website for more information on their newest faucets and other products.